Jana Korb creates aerial theatre, narrative circus and performances for public space. Thus she is working on trancending traditional borders by combining different genres: Physical theater is merged with contemporary circus, dance theater with trapeze art, performance with acrobatics. 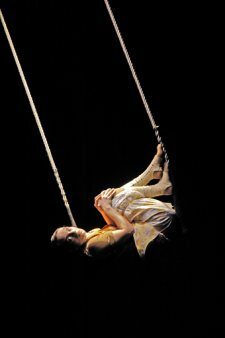 Using these methods, condensed, deep, and touching performances emerge, in which her circus arts become an element of narration, and aerial arts her language. 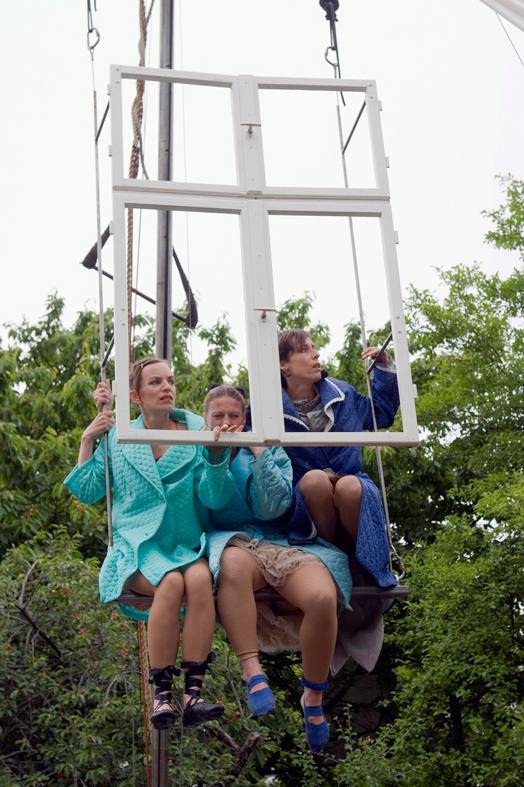 Her world of aerial theater is painfully human, is about personal dreams and examines pure emotions.She locates herself within the field of critical theory and feminism, and approaches her creation through the social tensions of age, gender, and body. 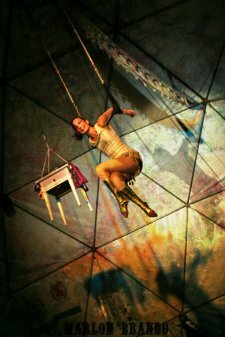 With the circus literature by Franz Kafka and Jean Genet, Jana Korb examines the existential essence of aerial arts, the art of aerial arts. She explores the topic of circus in literature and brings it back as theatric performance into the circus. With narration as the starting point, she develops her own circus body language. It is about dependencies, intransigence, and everlasting temporary – high up on the trapeze. 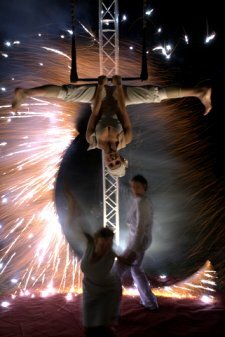 Circus trilogy with acrobatic reading, aerial theater, and chinese pole (70 min. ), in German or English language. Aerial theater on the fix trapeze (30min. ), in German, Czech, English, French, Portuguese, Dutch or other languages. With everyday scenes and a passion for detail Jana Korb tells a very personal tale. Daily rituals are grotesquely pulled apart and employed as dance elements on the ground and on the trapeze. Artistic tricks melt into a body language, exposing pain and yet moments later provoking laughter. A story emerges of the beauty of everyday movement, of dreams of flying, and of the recollections of an old woman. Vintage! Women! Variete! is a performative examination of traditional and contemporary circus history, a homage to our idols, a play toying with old and new circus techniques. This documentary circus theater tells true stories about real women - accompanied by a touring exhibition about women in circus, variety and acrobatics. Jana Korb is interested in bodies, situated between discipline and alternative ability, between adrenalin high and pain. Thus the microcosm of circus merely is an aspect of a society that bases its norm on physical inequalities. How is circus representative of this physical norm? 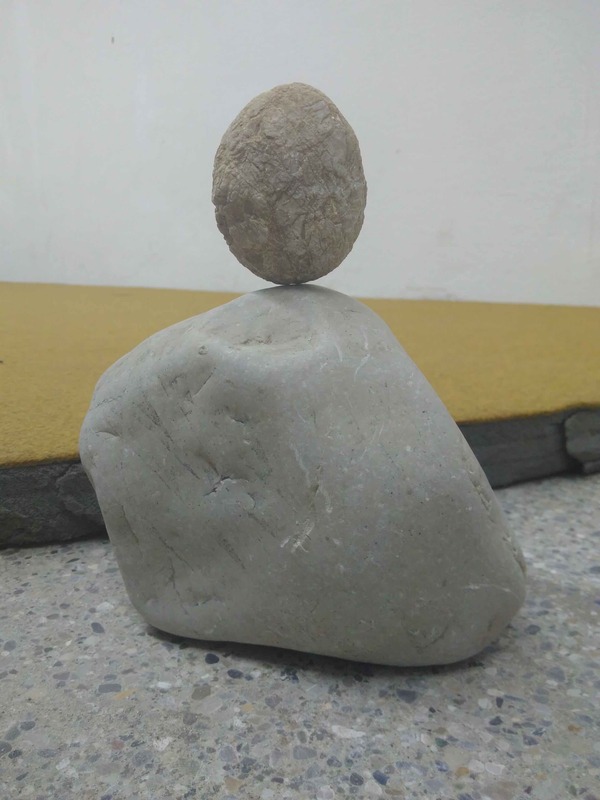 #ablebodiesandstones is searching for a circus of the future, is artistically exploring the future of circus. Funded by Initialförderung by Fonds Darstellende Künste. A piece about the best friend. A solo about the quiet cruelty and subtle manipulation of girls' friendships. A reminiscence about childhood "best friends forever". Memories without nostalgia. Yet, "Paper Dolls" is a plea for friendship! Unconditionally. Longing. For the best friend. Jana Korb interprets Margaret Atwood's novel "Cat's eye" as physical theater. Accompanied and supported by the voice of Jennie Zimmermann, her soundscapes and loops, with words that are aimed to mesmerize the audience. Open Air – Aerial Theater on freestanding rig (9m high) – english, appr. 45min. "In the past, people who had to separate would look for a star where their gaze might meet in the evening. At least they cannot divide the sky. The sky? This enourmous vault of hope and yearning, love and sorrow? The sky is what divides first of all." With aerial arts, dance, and fire arts we research new connections and choreographies, explore site specific conditions of our performance spaces, and play with public space. Performance with differing length (10-35 min.) on free standing rig.